Medium sized scandi galley kitchen in London with a belfast sink, grey cabinets, white splashback, metro tiled splashback, stainless steel appliances, medium hardwood flooring, an island and brown floors. 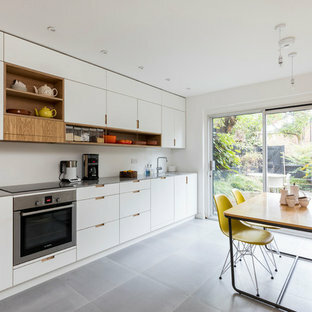 Medium sized scandinavian single-wall kitchen/diner in London with a submerged sink, flat-panel cabinets, white cabinets, laminate countertops, stainless steel appliances, slate flooring, no island and grey floors. 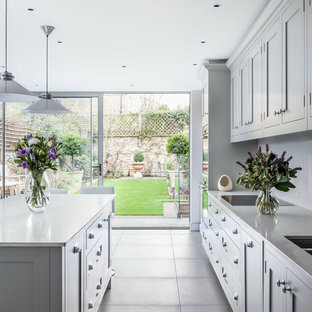 Photo of a large scandi kitchen in Surrey with shaker cabinets, black cabinets, integrated appliances, light hardwood flooring, an island, wood worktops and beige floors. 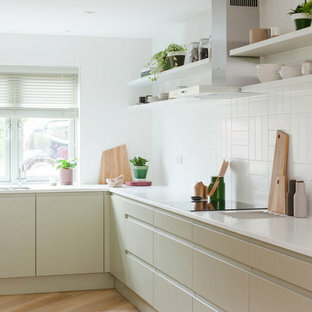 This is an example of a scandi kitchen in Cambridgeshire. Design ideas for a scandinavian kitchen in London. 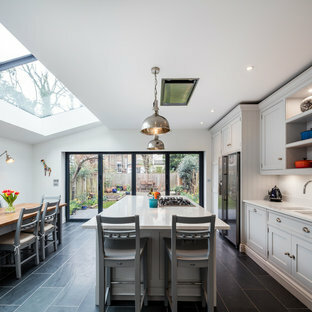 Medium sized scandinavian kitchen/diner in London with a submerged sink, recessed-panel cabinets, grey cabinets, composite countertops, grey splashback, stainless steel appliances, ceramic flooring and an island. 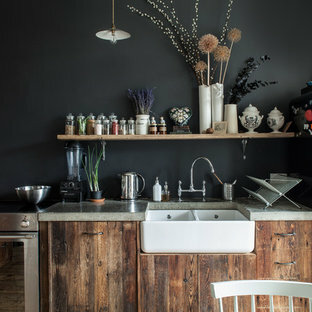 Inspiration for a scandi kitchen in London. 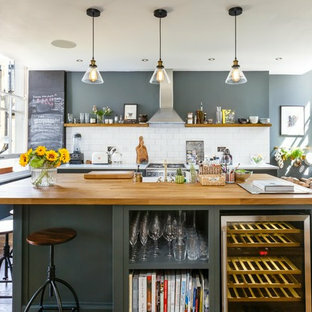 Inspiration for a scandinavian kitchen in London. 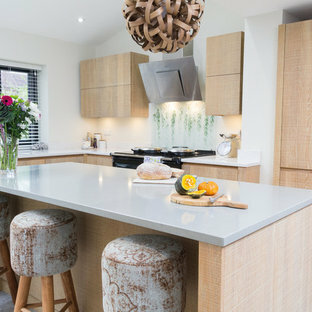 Shaker style oak kitchen painted in Farrow & Ball Pavilion Gray with Bianco Venato engineered quartz worktop. 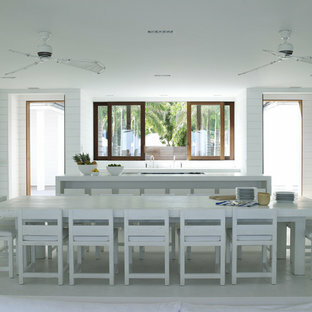 The island has a built in exposed oak breakfast bar with beech stools. It also features under mounted Shaws double farmhouse style sink. The three Lightyears Caravaggio steel hanging pendant lights add a subtle touch of colour. Cole and Son Woods wallpaper beautifully compliments the kitchen with floating oak shelves, oak mantelpiece and colourful ceramics adding the finishing touches this stunning kitchen. Large scandi u-shaped kitchen/diner in Hertfordshire with flat-panel cabinets, white cabinets, light hardwood flooring and a breakfast bar. 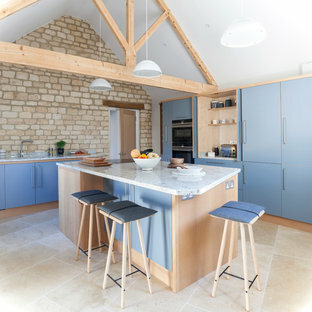 Photo of a scandinavian kitchen in Oxfordshire. Design ideas for a scandi l-shaped kitchen in London with a belfast sink, shaker cabinets, white cabinets, black appliances, light hardwood flooring and an island. 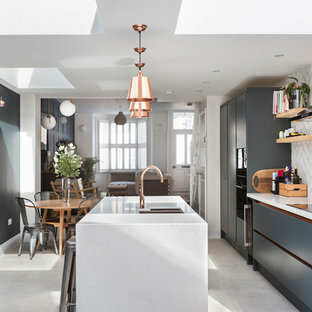 This is an example of a scandinavian single-wall kitchen in London with flat-panel cabinets, blue cabinets, wood worktops, blue splashback, light hardwood flooring and an island. By Best of Scandinavia Ltd.
We produce every door in-house at our production in Denmark, which grants us the opportunity to produce and develop new ideas. This gives the option to use a wide spread of materials, of course some are more common than others, but we more or less create what is asked as long the functionality is not compromised. Typical materials we use are: pine, teak, mahogany, birch, ash and both dark and light oak. The coating of the surface is specific to almost every project. It can be natural, oiled, lacquered, painted or another new method. The natural looking surfaces are made as veneered or solid wood constructions - depending on the task. The flexibility is wide! We always seek to use the best of materials, to be certain about the great quality of the product, which lasts many years of use. Inspiration for a scandi kitchen in London with a submerged sink, glass-front cabinets, white appliances, an island and grey splashback.